Image © DC Entertainment. Written by Tom King, art and coloring by Mitch Gerads, lettering by Clayton Cowles. Unlike the last few issues, this one takes place mainly on Earth, in the continuity where Scott Free, Barda and their infant son Jacob are living a mundane existence in a nondescript apartment in an anywhere, USA neighborhood. 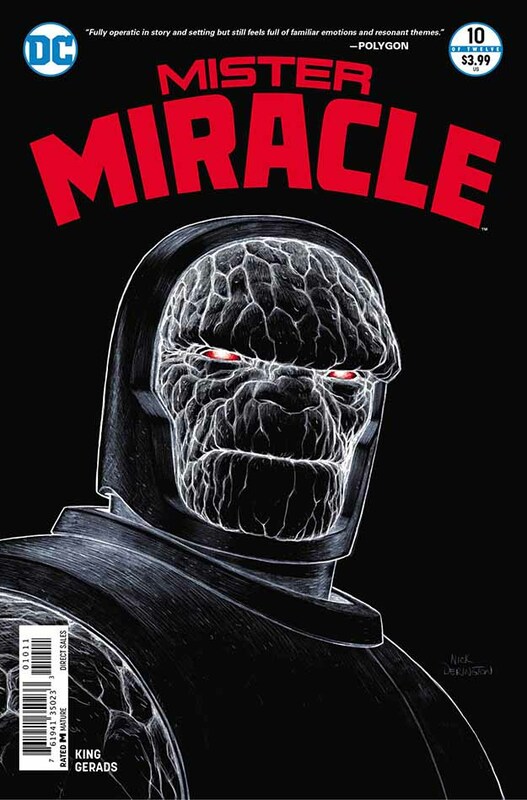 Scott continues to be torn apart by the decision he’s been asked to make: he can halt the current war between Apokolips and New Genesis, thereby saving millions of lives, if he is willing to give his son Jack to Darkseid. Scott and Barda grew up on Apokolips, so they know full well what that would mean for Jack. Barda is understandably against it, but Scott is wavering, haunted by the choice. Not much happens physically this issue, but a great deal happens emotionally and between the characters. It’s an issue that shows how powerful good comics writing can be. Oh, and how did I not notice before that the baby has the same first name as his parents’ creator? This entry was posted in Comics, Reviews on August 15, 2018 by Todd. It’s by Nick Derington, and I agree!